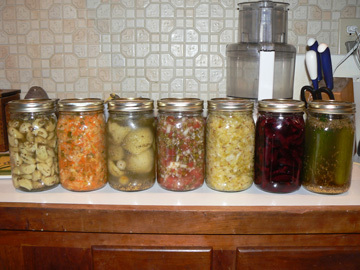 Okay, I’ve gone canning crazy. I love the recipes from Nourishing Traditions by Sally Fallon. 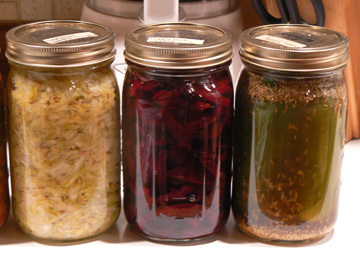 The things I’ve been canning use no vinegar. 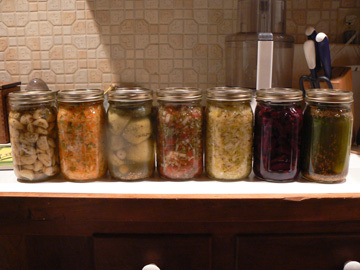 The vegetables are pickled by natural fermentation. We’ve already eaten a several jars of kimchi, pickles, and green tomatoes. They were all fabulous. Since they are fermented, they all have a fizzy rich taste that just doesn’t happen with vegetables pickled with vinegar. We love them, so guess what the family is getting for Christmas gifts? I canned 18 jars of good stuff in 2 days. 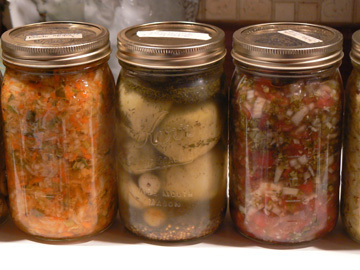 Talk about a marathon.Below from left to right: garlic, kimchi (Korean sauerkraut), green tomatoes, salsa, sauerkraut, beets, cucumbers. I have a love for God’s beautiful creation. He has created such a variety of foods for us to enjoy. What I really found amazing was not only the aromas that came from pounding some of the vegetables, but the huge variations in color and texture. The pattern in a sliced beet is art. The depth of its color is insurpassable. God was so intentionally creative for our pleasure. He loves us so much that he makes the smallest detail of his creation just simply stunning. This is not even touching on the flavors. I think God was very intentional with all He created. If we were to really use his bountiful foods as He intended, we would have very little waste. Take raw milk for example. I buy a gallon of cow’s milk each week from a local farmer. We don’t use the whole thing, so whatever I have left at the end of the week I throw out, NO. By the end of the week, raw milk begins to taste a little “cowy,” so I set the remainder on the counter for 3-4 days at room temperature. The milk naturally separates into curds and whey. After straining the whey from curds using cheese cloth, I have two very usable, consumable products. The whey I use in pickling and as a drink (which has removed the arthritic stiffness from my fingers). I substitute the curds in all recipes calling for cream cheese. One of the family favorites is to blend the cream cheese with raw garlic and a bit of flax seed oil for a fabulous “cream cheese” garlic spread. Thank you, God, for your perfectly delicious foods that you created for my pleasure and enjoyment. I think I’ll go eat a pickle now. 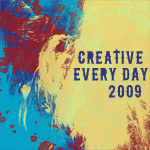 I would just like to say, this is my frist time viewing your site, and I know you get this all the time, from reading your comments, but I am going to like religiously review your site everyday for inspriation. I am currently not working, stuck in the house with depression and getting over addiction for a year now in Dec so you can assume I have spent some time on the internet and have NEVER found a site so powerful as this, for me at least. Not only has art and my relationship with God seriously helped me over the past year but i just couldn’t get the right “word” i needed to hear. You pretty much summed up everything I needed since Dec. wow. I’m not only getting so much inspiration from everything but I’m dying to get my paints out and actually have MOTIVATION. one step at a time… and thank you amanda, you have now helped me finally get to the next step. much gratitude for even wanting to help inspire others and have the time to make your words known on the interenet and across America. Thanks for this beautiful comment, Nicole. I can relate! 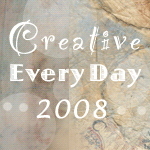 I’ve just recently moved my blog to amandajolley.com. Still has all the old posts, but I have plans for expansion. 🙂 All my new posts and updates will be there. Have an inspired day!